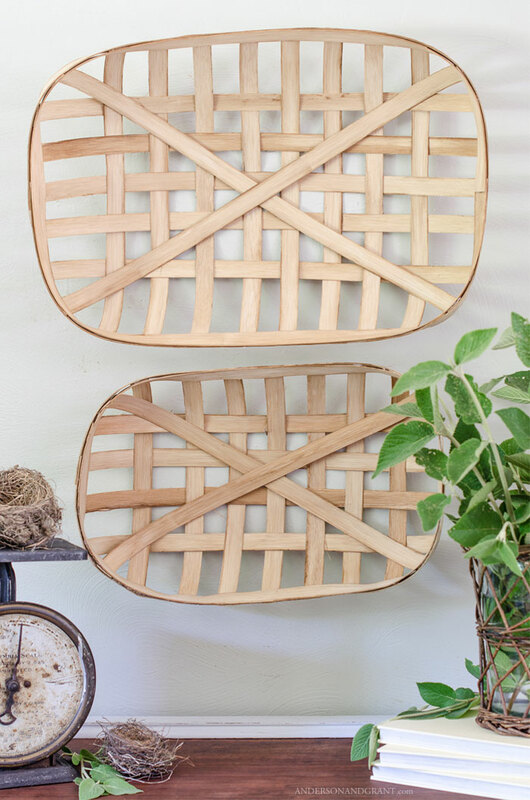 For about two years, I've had the idea of constructing my own version of the tobacco baskets that are seen decorating so many farmhouse and country style homes. They have such a rustic, imperfect look to them which I find really appealing. But, they are also pricey and I knew the idea was something that could be created at home if I could find the right materials. I've seen tutorials done using wood veneer cut into strips, but that seemed like a lot of extra work and so I kept searching until I found something that would be easier. The "easier" material I found was flat reed used to make actual real baskets.....why did it take so long for me to find that?!?! On Monday, I shared with you my "all-natural" rustic wood stain. While I did the post using some brand new clothespins to dye, I was actually experimenting with the technique for this project. 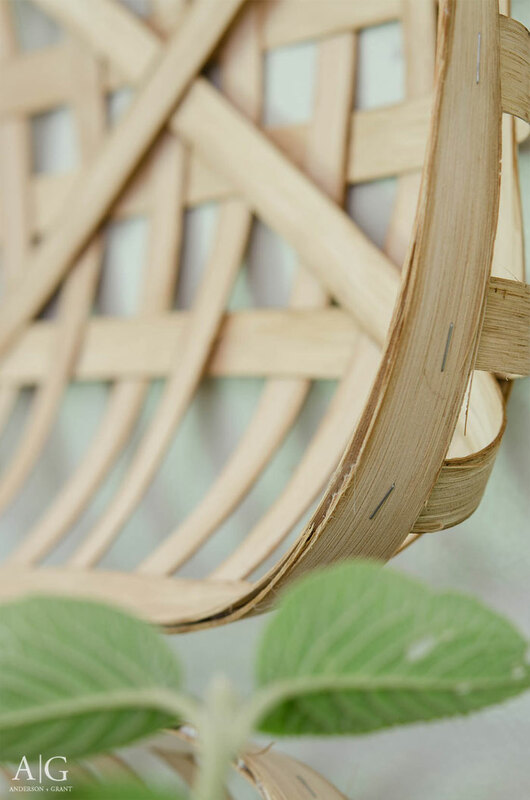 The reed that I purchased to construct the baskets was very light colored and not the look I was going for.....but I didn't really want to spend the time staining strip after strip to make them darker. I played around with an easier way to give a darker, aged stain to the wood. This reed does not take the staining as well as the clothespins, though, so you may want to do the process twice to achieve a darker finish. The baskets pictured were made of reed that was stained only once. Until recent years, a tobacco basket was used to hold bundles of tobacco leaves waiting to be sold at the market. The auction house floors where the tobacco was unloaded were dirty with mud, dust, and manure from the mule-driven wagons bringing it in. R.J. Reynolds Tobacco Company came up with the idea of having a large, flat basket that would keep the tobacco leaves off of the floor. These baskets were made of two inch oak strips nailed together and had the tobacco companies name stenciled onto the edge. Tying the tobacco into the bundles was a time consuming job and the process ended when the leaves began to be wrapped untied in burlap sheets to bring it for sale. The need for tobacco baskets came to an end and companies ceased production around 1970. 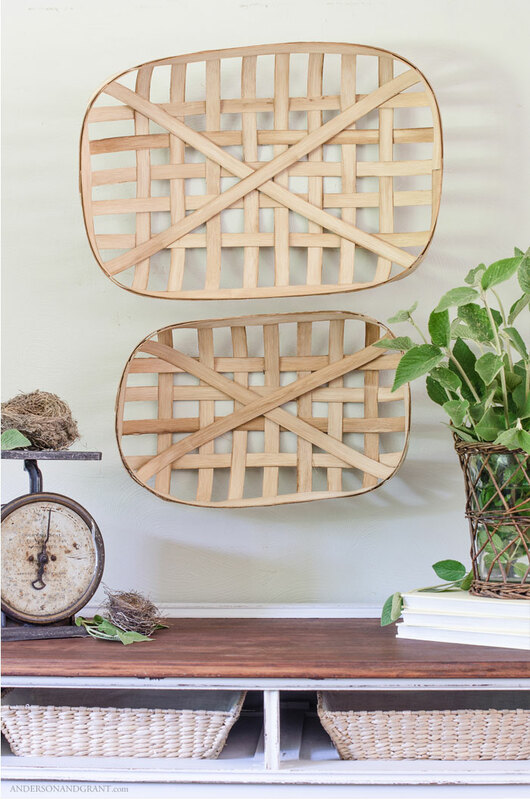 Those old baskets have become quite popular lately to hang on walls or rest on shelves. 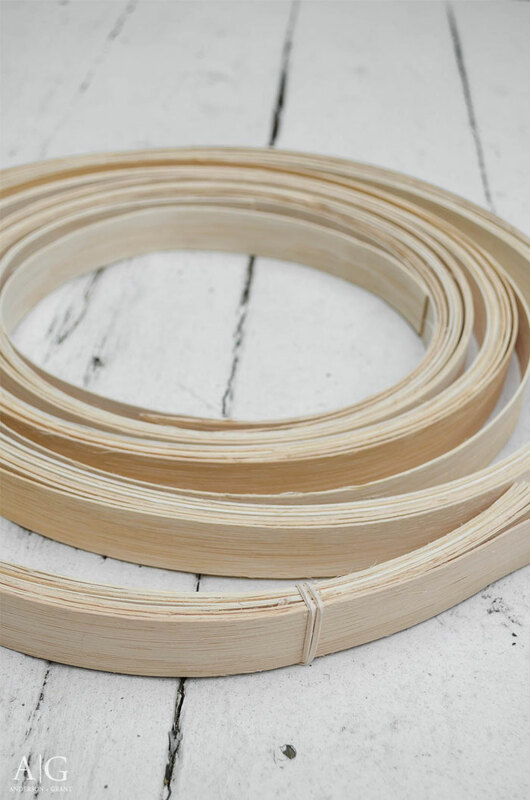 * A one pound coil of reed contains about 75 feet and will produce one basket of each size shown in the picture. 1. Create a strong "stain" of instant coffee in a large pot. (The entire process can be found here.) Soak the entire coil in the pot for at least a few hours or up to overnight. Sprinkle extra instant coffee granules on top of the coil to create some spots of age for your basket. Take the coil out of the coffee stain and allow to dry completely. If you would rather use regular wood stain for this project, you many want to cut the reed using the measurements below first so that you have smaller pieces to stain. 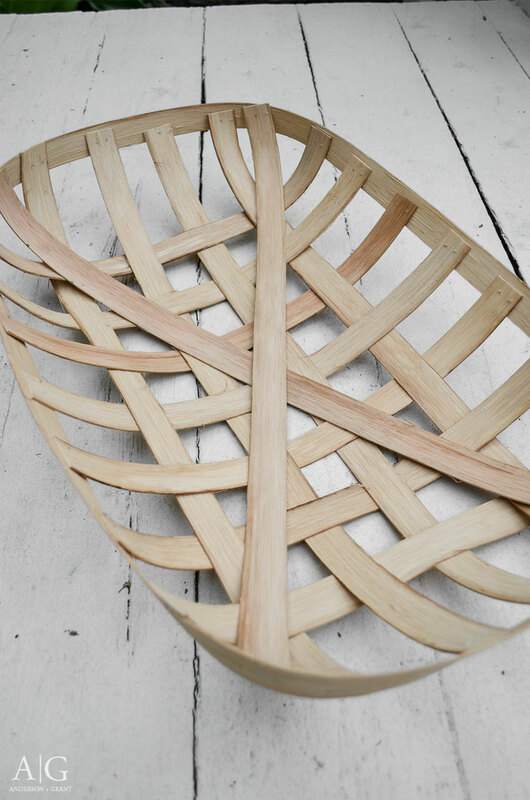 For the LARGE basket, you'll need 5 pieces measuring 26 1/2 inches and 8 pieces measuring 19 inches. For the MEDIUM basket, you'll need 4 pieces measuring 22 1/2 inches and 7 measuring 14 1/2 inches. 3. 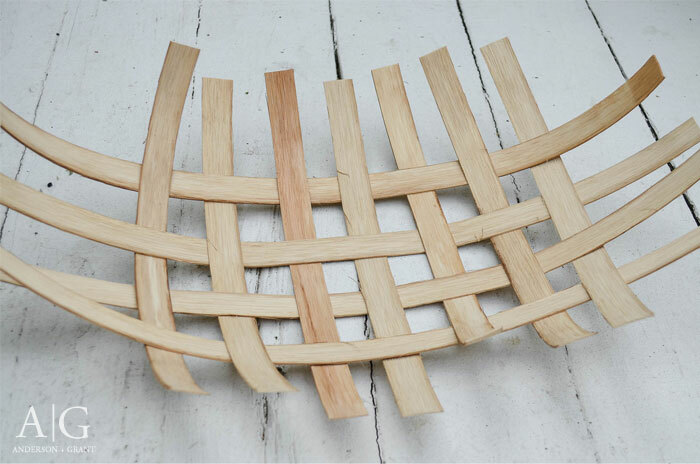 Lay the strips out on a flat surface weaving them together to form the basket shape. Use binder clips to stabilize everything until there are enough strips to keep the pieces together. 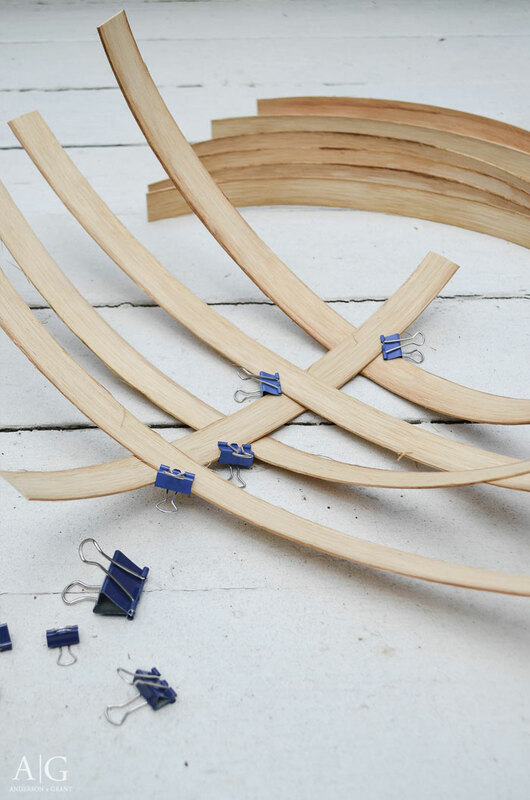 Again, use the binder clips to attach the long strip to the woven basket strips. When the weave is evenly placed along the outside, use a stapler to secure it all together. The nice thing about using staples in this project is that they can easily be removed if a strip needs adjusted. The first basket I made, I used hot glue to hold everything together, but it wasn't nearly as sturdy and was very hard to move the weave around if need be. Attach those with the stapler as well. 6. 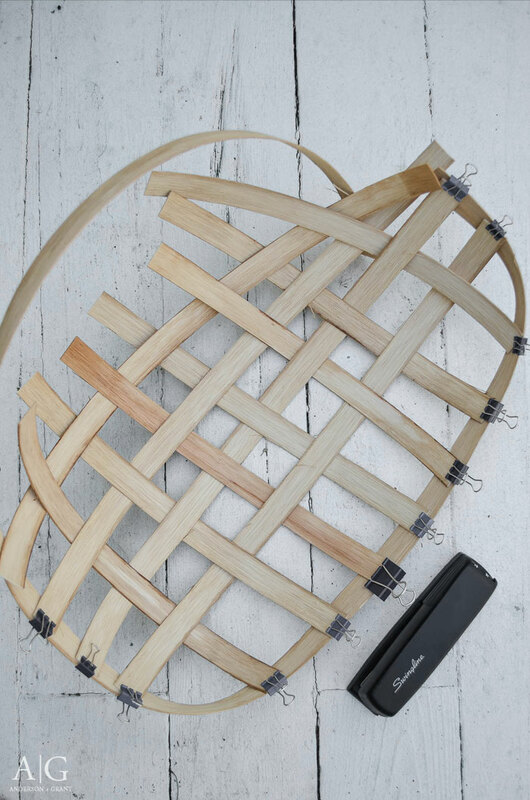 Take another strip of reed the same size as you cut for the outside of the basket and use hot glue to attach it onto the inside of the basket to finish it off and hide the staples. 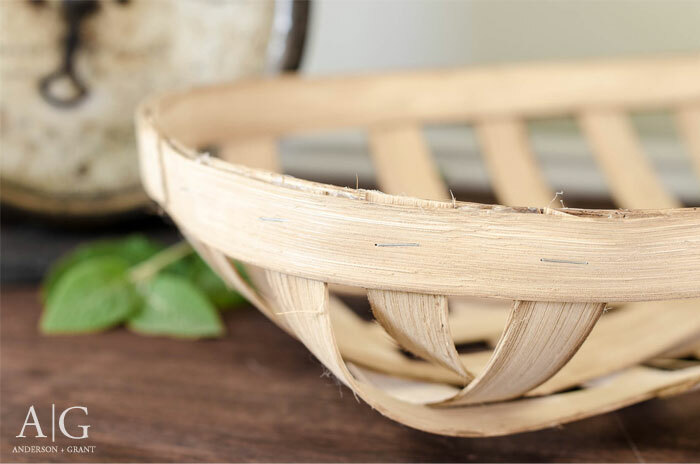 This double layer of reed makes your basket more stable. You might find that as you staple some of the pieces on, the reed may split. It may also seem like is unraveling a bit around the edges. This all will add to the imperfect nature that any old tobacco basket would have, so don't get upset by this. 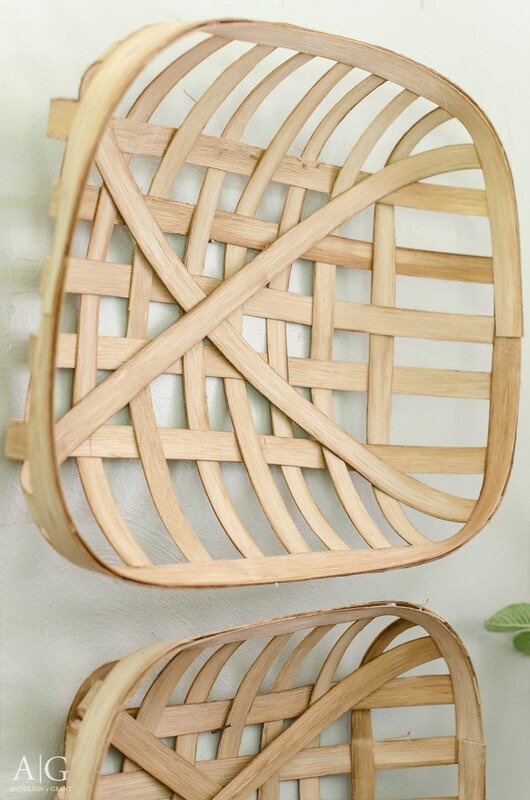 You'll often see that the real versions have broken pieces of basket and are not necessarily evenly woven, so perfection is not necessary. 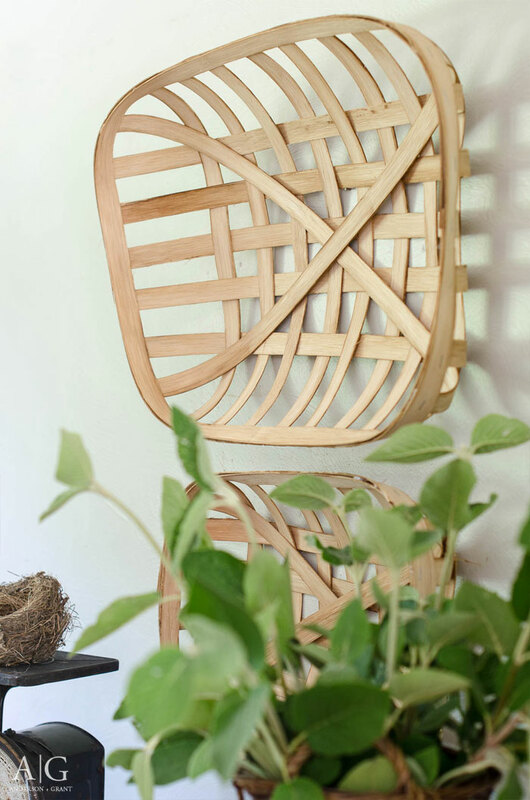 The size of your baskets can be made bigger or smaller depending on what you want. I'd actually like to put together a large square one with the reed that I have left. 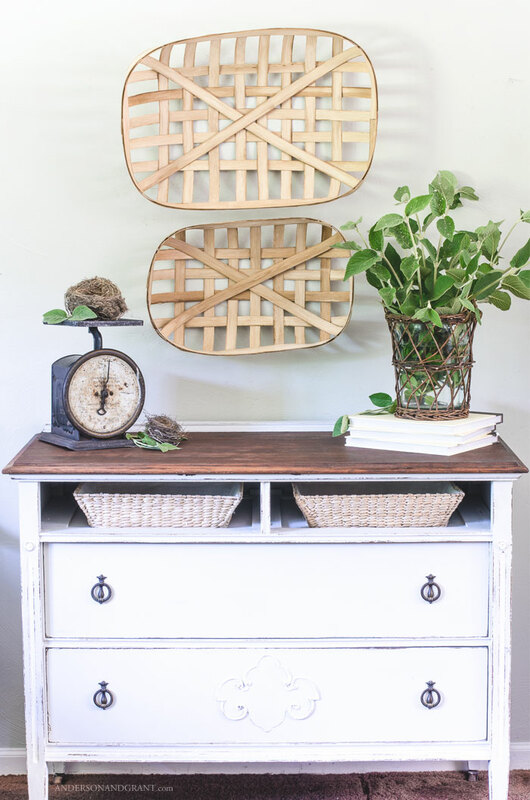 While places like Ballard Designs have baskets for sale at close to $200, this entire project costs about $20....even less if you wait for free shipping or use at coupon online at Jo-Ann Fabrics. You don't always have to spend a lot of money in order to create a stylish home with the decor you want. What popular decor trends have you found a way to DIY and personalize?